Returning up Queen Street, the next house in South Street was the old white house facing south, opposite Weaver Row. In this house lived Mr. Francis Sudbury, and he had a one-room detached building next to this where he carried on his business. Born in 1798 Francis Sudbury senior was a son of stockingweaver William and Sarah (nee Thompson). In July 1826 he married Ann Mather, daughter of iron founder George and Hannah (nee Hirst). The 1841 census has Francis in Bath Street as a framework knitter with his wife and six children but within a few years he moved into South Street where we might more fully describe him as ‘silk thread, cotton and wool glove manufacturer’ operating as Messrs. F. Sudbury and Sons. He was also a grocer! Mr. Sudbury senior had three sons and four daughters (writes Adeline) … but in fact there were four sons and five daughters born to Francis and Ann. William, who became a butcher, married a Miss Gamble, of Nottingham. (He) continued to live in the old white cottage. Some years after he went to live at Oak Well Farm. Eldest son William was born in March 1829 and established himself as a butcher about 1850, initially in South Street, marrying Mary Gamble, daughter of Robert and Sally (nee Spencer) in 1851. The Gambles were an Ilkeston family although Mary was born and baptised in Loughborough. After a period in the early 1860’s trading in the Market Place he moved to farm at Oakwell Farm on Derby Road in 1867. William took an active part in parochial matters being a member of the old Highway and Sanitary Board, was elected onto the first Local Board and served on it for all but one year of its existence. A staunch Non-conformist and member of the Independent Chapel, he was a thorough Radical Liberal in politics. He died at Newton Burgoland near Ashby in Leicestershire in July 1891, while visiting his friend, farmer Moses Evans, and was buried at Stanton Road Cemetery. 2. Charles married Marina Burgin, daughter of Richard Burgin, who lived in the old house against the blacksmith’s shop in South Street. When F. Sudbury died the firm became C. and F. Sudbury (formerly F. Sudbury and Sons). Born in March 1831 son Charles married Marina Burgin-Richardson, daughter of Robert, blacksmith and farmer of South Street, and Mary (nee Wheatley) in June 1854. In the early 1870’s, after the death of their father in 1865, Charles and brother Francis junior traded as ‘C. & F. Sudbury, Queen Street and at Nottingham’. And it was Charles, wife and family of (then) eight children who left Ilkeston about 1870 to manage the Nottingham interests. There were eventually at least 11 children of this marriage, the first eight being born in South Street. Number nine was Frederic Marcus born in 1870 in Nottingham where Charles was to live out the rest of his life. He died at Cavendish House in The Park in June 1902. 3. Francis, who married Elizabeth Bennett, eldest daughter of Mrs. Bennett, of the Wine Vaults, East Street. 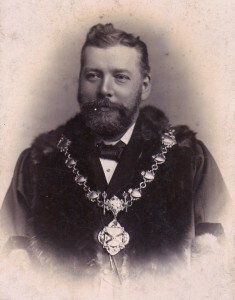 Francis junior later became first Mayor of Ilkeston. Born in October 1842 Francis junior was the youngest son and married Elizabeth Bennett, eldest daughter of William and Elizabeth (nee Smith) of the Old Wine Vaults in April 1866. The family later occupied Field House and it was there that Elizabeth died in October 1924, aged 79. Francis Sudbury as Mayor 1887-1888 (courtesy of Ilkeston Reference Library). 4. 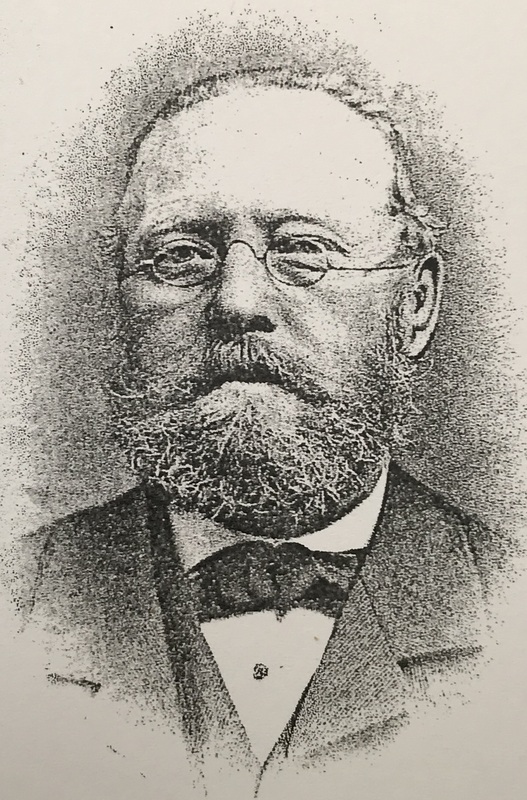 The one son not mentioned by Adeline is Samuel, born in August 1833. He moved out of Ilkeston in the 1850’s, perhaps before Adeline was born and found his way to Monks Coppenhall in Cheshire where he worked as an engine fitter. Carrie or Caroline was the eldest child born in 1827. She died 50 years later, in August 1877, unmarried and still living in South Street. This daughter was Sarah Ann (the second), married in July 1866 to Kirk Hallam farmer George Evans, son of Thomas and Catherine (nee Robinson). Less than three years and two sons later George was dead. His widow continued to live in South Street (on the other side) trading as a grocer, initially with her widowed mother and than independently, after her mother’s death. Elizabeth Hannah was born in 1837 and married William Merry, chemist’s assistant of the Market Place, in May 1860. For a short time they came to live in the house in South Street provided by her father before moving to the Merry premises in the Market Place. They later lived at Holmdale House in Station Road and about the turn of the century moved to Parkhyrst in Park Avenue. William died there in December 1906, aged 72, and Elizabeth Hannah died almost exactly ten years later at the same address. Ellen was the youngest child, while Herbert Tatham was the oldest child of needlemaker Amos and Eliza (nee Bell). They married in September 1869 and lived in South Street before moving into Stanton Road in the late 1870’s. 9. The other daughter understandably not mentioned by Adeline was Sarah Ann the first who died in 1840, aged four. Mr. F. Sudbury senior built the three houses and shop at the entrance to Weaver Row, and he and his family removed from the old house to the house and shop opposite. He removed into the one with the shop attached. Mr. William Merry, who had married the eldest of Sudbury’s daughters, lived in the middle one. Mr. Charles Sudbury lived in the end house. When Mr. William Sudbury left the old house, and took over the Oak Well Farm, Mr. Flint, the shepherd, went into the old house, his sister, Miss Flint, being his housekeeper. One day mother sent me to Mr. Flint’s to ask for the loan of his churn. When I had given mother’s message to Mr. Flint he looked at me and said ‘ Churn-n! Churn-n!’. Miss Flint heard him, and came to the door, and we three stood there looking at each other. At last Miss Flint had a brainwave. She turned to her brother and said ‘Ow manes T’chon’. So I got ‘T’chon’ and went home in glee. Mr. Flint always wore a smock-frock, and an old top-hat. He could be seen every day going down Queen Street followed by his sheep dog. The South Street shepherd was Greasley-born George Flint, son of John and Ann (nee Housley) who came to Ilkeston shortly after his marriage to Anne Ford, daughter of William and Jane (nee Brooks) in June 1843. One of their sons, Richard, married ‘the girl next door’. (See the Nag’s Head). Son Henry was employed at the engineering works of John Whitehouse where he was killed in a frightful accident in 1872. Living with George and his family was his younger sister Mary – ‘Miss Flint’ — who stayed with them until her death in South Street in July 1874. The family then moved into Stanton Road and George died there in December 1878, aged 77.